As an old school single photo and text blogger, Bambuser has changed the game as it offers lightening quick GPS tagged broadcasts as video (or audio only) and collates all feeds in a single page. Not only that, when you start a new broadcast - you are shown on the Bambuser homepage (increasing viewers). All the other tools like connecting twitter (and other accounts), embedding to your site, chat stream, location are standard. Ron Jackson - I'm hoping we can "up" the quality of our vids from what is shown live, and I believe +Robert Redle said that was indeed possible. Was this shot on a HD camera Mike? Also I'm going to release a short "tips" video for shooting with lightweight cameras on the go in the next day or so. Mike Downes - +Robert Redl Robert, Ron mentioned you above, not sure if iy plussed you in..
Ron Jackson - I don't know why my "+-ing" sometimes works and other times not. The only reason I opt for higher resolution in vids, is viewer fatigue. Lots of studies over the years pointed me to the fact that the less a viewer strains, the longer and more concentrated they can be involved with the report... but I agree that keeping things simple is a good thing! Ron Jackson - The max res on most phone cameras can do 420 or 740i. I eagerly await tomorrow's iPhone announcement and am going today to chat with Verizon about switching to their service. +Robert Redl (see it works now!) ... mentioned that you can upload a higher quality video later to bamuser. I think trying higher rez with only 3g is asking for trouble as in stuttering live video. Robert Redl - hi ron the plusing works with Redl but not with Redle as then there is no match. typing a part like "Robert Re" should also be enough if you then use the autocomplete results and depending on the number of Robert's you circled. Ron Jackson - Yea the extra e might have done it. I must not have looked up while typing "Robert"! Then again, I've had this issue before and not gotten suggestions on the first few letters of a name. Vanessa Pearce - No one seems to be worried about the mouse! Poor thing.. Although it looked the size of a small cat. Loving Bambuser though, will certainly check it out. 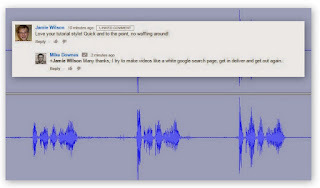 Mike Downes - +Vanessa Pearce Great to see you commenting here - are you up for hangouts yet? We are hanging out now.. do you want an invite? Robert Redl - For me the key of bambuser is realtime . At the same URL the application creates you see the video live and also on demand if you come to that URL later. I have not seen another solution being that seamless without interruption from live to on demand. All others I have seen need time to process the video before it is available on demand. And as said the most easy to use and most devices supported. Robert Redl - Dear +Paul O'Reilly you are right about security concern on smartphones. I solved it for me with a very simple approach. I keep devices separated by their core feature. So I have a small old mobile phone just for that, separated from the smartphone, a compact digicam for photos and HD videos, and now the ipad for wireless 3G video reporting on the go. Robert Redl - Oh for sure, most of that electronics stuff is way too expensive (compared to the value). I only have this collection because it is part of my business. Mike Downes - +Paul O'Reilly Great you are giving it a go. I feel that everything merges between personal and business these days. I've heard of many people using tech for work, then switch to personal for immediate effect and impact. G+ is a great example, where if we are all honest - we do it because it is fun and kinda cool.